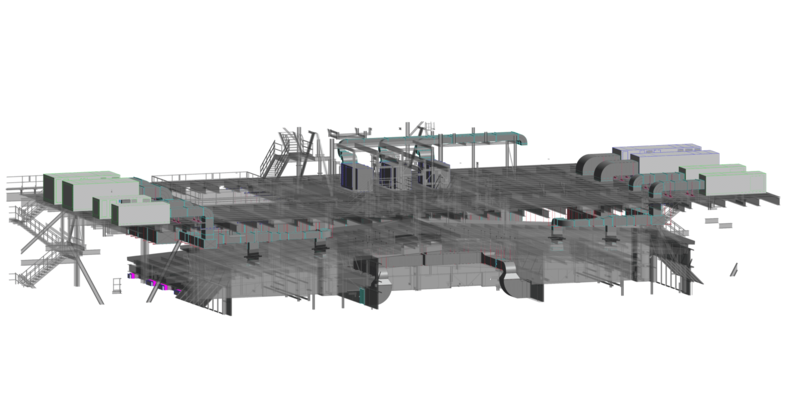 A 3D BIM model is a 3D graphic database which is full of information. At B1P Group, we know how to carry out large infrastructure projects, such as rail or road projects, and small residential buildings, for example villas. Think about the time a single studio can take to make a Quantity Take-off, or to make every sheets of a project. You can guess it is a lot of time. With our BIM service, we will do all the hard work for you while you are investing your time in making all the small design choices to the project. Our BIM 3D model helps stakeholders to manage their multidisciplinary sectors more effectively and to model and analyse complex spatial and structural problems. Throughout our 30-year experience in project design and management with our partner ATP Group, we decided to build a team of engineers and/or architects in order to work on your project. On designing the process backed up by BIM and checked even before the project reaches on-site help avoid potential problems and clashes on site. Using our BIM design support services, clients can considerably reduce the cost while maintaining time efficiency. Our 4D BIM service allows stakeholders to extract and visualise the progress of their activities throughout the project phase. It can be either a healthcare facility or an infrastructure project: we will model and visualise each construction phase and even the construction site planning activities. Our models are used to export Quantities and 4D sequence simulations, like sheets, renders or video simulations. We we incorporate building parameters activities with the support project software. In this way, we can use our model like a visual scheduling layer. This is the best way for each stakeholder to plan and design the project, and even builders and manufacturers will optimize their building projects and team coordination. 5D-BIM model allows us to monitor and calculate costs throughout the design process. With 3D and 4D model, the fifth dimension add a new layer of control which gives a better estimate on costs over the course of time. Our 5D model allows each stakeholder to keep global control of the design process. Our BIM models provide complete information about the costs of each item and can give an estimate of it in real time. Every little change during each design phase can return changes of the overall costs in real time. 6D-BIM Model is the support to perform energy consumption analysis. Using a 6D-BIM technology can lead to more complete and accurate energy estimates even during the design process. We help Architects, Builders and Property Developers to undertake Green Building initiatives and LEED Certification. We have experience in modelling services with various parameters such as lighting, location, solar insulation and more. 7D-BIM allows stakeholders to keep track of all the construction and building information, such as product placement and data, operation and maintenance manuals, cut sheet specifications, photos, warranty data, web links into online product sources, manufacturing information system, contacts, etc..
We work in projects with buildings, infrastructure and Oil&Gas systems: each one has its own workflow but everyone has the same objective: a model that can be used to offer facilities and realise assets for our clients. 7D-BIM technology can lead to easier and quicker replacements of each part, as well as optimized compliance and a streamlined asset lifecycle management over time. In this way, our model will be used for the facility operation and maintenance throughout the building lifecycle by managers.